News, updates, offers about domestic and commercial cooker and oven cleaning. Ovensmartz continues to expand its domestic cooker cleaning service and spread its wings into new areas. But, as a family-run business we know that our customers appreciate the personal touch being locally-owned brings. Owning the business, not an oven cleaning franchise, gives us more flexibility and the freedom to run the business and offer the level of service we know our customers have come to expect. We don’t have anyone with rules and regulations setting our prices and are free to provide the type of service right for our business. This helps keep our Oven Cleaning Prices competitive, enabling us to offer a domestic cooker and oven cleaning service to meet the needs of each individual customer. Dunfermline & Fife households can now get their ovens cleaned to the same professional standard only available, until now, to customers in and around the Falkirk area. As a local cleaning company, based in Bo'ness, Ovensmartz have been building a regular, satified customer base in Central Scotland. Our level of service and competitive pricing can only be offered if costs are kept to a minimum. If the quality of work carried out is to be maintained, travelling costs, parking and other overheads need to be controlled. A Clean Oven for Xmas Turkey! Your Oven Cleaned for Xmas - Still Time! There is nothing worse than a smoking oven and the smell that fills the kitchen. And, it's even worse when it's on Christmas Day with all the family looking forward to their turkey dinner. With it wafting through from the kitchen, it will affect the expectation of your guests regardless of whether it spoils the end result or not. So, it is a good maxim to be "Better Safe than Sorry". 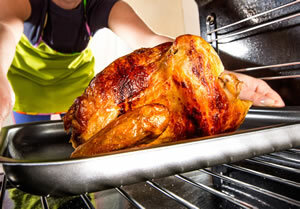 Read more: A Clean Oven for Xmas Turkey! Ovensmartz is now able to provide professional cleaning of ovens & cookers in the Bathgate & Livingston areas. As a family run oven cleaning company, based in Bo'ness, Ovensmartz has been steadily building up a regular and satisfied clientele in the local Falkirk area. Situated only a few miles from Livingston, over the Bathgate hills, Ovensmartz is now expanding to offer expert & professional oven cleaning services for both domestic and commercial users in Livingston & Bathgate and the surrounding areas of Broxburn, Whitburn and Armadale in West Lothian. Introduce a friend, relative or neighbour who have their oven cleaned when you do and both of you will receive a 10% discount! Introduce 2 friends, relatives or neighbours and you all receive a 15% discount! Give them a call and book your Oven Clean Today! I have used ovensmart 3 times now and on each occasion have been in awe at the job Ian done! I always recommend him. First class job and soo friendly too.